This is a screenshot from the Global Footprint Network. 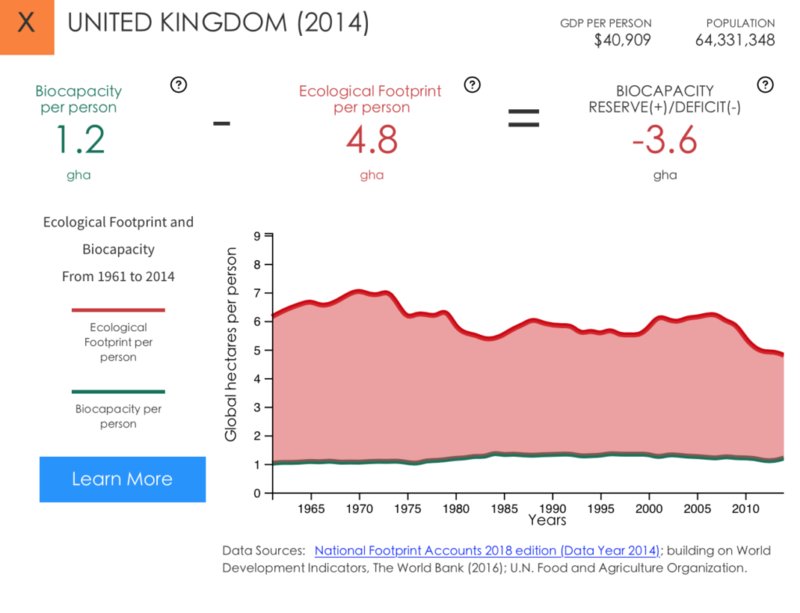 It shows a reduction in the UK’s ecological footprint. This is good news, right? Well, yes, the footprint is getting smaller, but it is exactly 4x the country’s biocapacity, leaving a significant ecological deficit. An ecological deficit occurs when the Ecological Footprint of a population exceeds the biocapacity of the area available to that population. A national ecological deficit means that the nation is importing biocapacity through trade, liquidating national ecological assets or emitting carbon dioxide waste into the atmosphere. An ecological reserve exists when the biocapacity of a region exceeds its population’s Ecological Footprint. I’m sharing these data because Earth Overshoot Day has just recalculated the date when “humanity’s demand for ecological resources and services in a given year exceeds what Earth can regenerate in that year” (link to quote). That date is now August 1st (back in the 1970s it was December 31st). Another way of putting it, and the way that Earth Overshoot Day likes to put it, is that we need 1.7 planets to support humanity’s demands on Earth’s ecosystems. I say humanity, but some populations consume more than others. Per capita, Iceland, Norway and Bahrain (the highest consumers of electricity in 2016) consume more than Haiti, South Sudan and Niger (the lowest). Furthermore, The World Resources Institute have put together an interactive map of the globe so that you can see which countries emit the most CO2 over time. And it’s also important to point out that most of the heaviest emitters are not human at all, with one study suggesting that just 90 companies were responsible for two-thirds of all global CO2 emissions. The situation is reversible. Research by the group indicates political action is far more effective than individual choices. It notes, for example, that replacing 50% of meat consumption with a vegetarian diet would push back the overshoot date by five days. It’s worth pointing out that this isn’t Watts’ best piece. It’s quite sloppy to be honest. For one, the research group doesn’t make this claim, and if it did it would contradict pretty much all of its subsequent analysis (all of the recommendations that flow from the group’s data are aimed at individual behaviour changes – ‘streamline your wardrobe’, ‘start a population conversation’, ‘travel with eco-sensibility’, etc). For another, individual choice and political action are not mutually exclusive. And, finally, the link to the 50% claim about switching from a meat to a vegetarian diet actually takes you to a different study reported in the Guardian in May 2018. But never mind that. Having conquered our fears and decided to act, there are things we can do in the immediate term. Next hardest: start talking about global warming like it’s actually an existential crisis and not just a minor inconvenience. This idea has been percolating global health discourse since Costello and Watts urged us all “to shout from the rooftops that climate change is a health problem”. That was five years ago – do you hear any shouting? No, well there’s plenty to shout about, as the PLOS Collections special series on climate change and health makes abundantly clear: sewage from storm water, heat-related mortality trends (see extract from the New York Times article below), wild fires, women’s health, ozone-related acute excess mortality, nutritional deficiencies, reduced cognitive functioning, the list of health-related impacts of global warming are without limit it seems. “She had traveled for 26 hours in a hot oven of a bus to visit her husband, a migrant worker here in the Indian capital. By the time she got here, the city was an oven, too: 111 degrees Fahrenheit by lunchtime, and Rehmati was in an emergency room. The doctor, Reena Yadav, didn’t know exactly what had made Rehmati sick, but it was clearly linked to the heat. Dr. Yadav suspected dehydration, possibly aggravated by fasting during Ramadan. Or it could have been food poisoning, common in summer because food spoils quickly”. 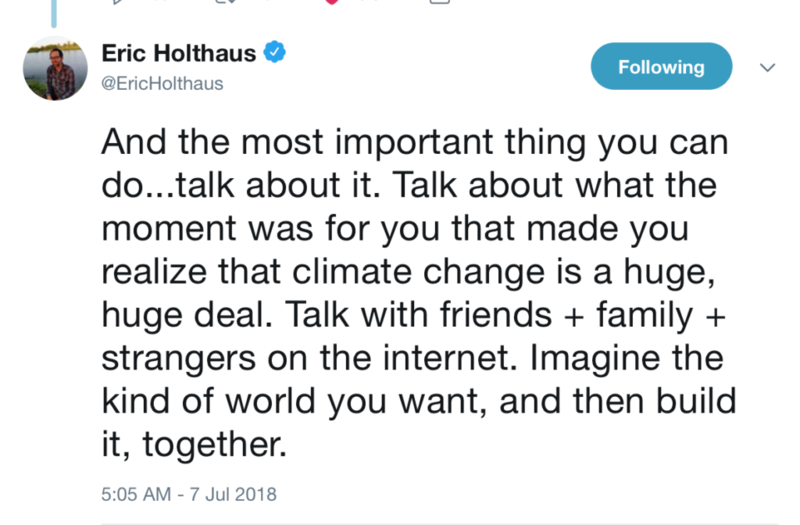 But it took an article in Climate Home News – My baby can’t sleep from heat, why aren’t we talking about climate change? – to hit a nerve with parents. The sound of collective pennies dropping echoed around social media. This is a good thing. Indeed, as Woodworth and Griffin’s book Unprecedented Climate Mobilisation argues, talking about climate change and global warming is at the heart of mobilisation (an eBook copy will cost you £7, which is money very well spent – 2 cups of coffee). The problem is that the media should be taking the lead in this conversation, but it’s not – quite the opposite in fact. In a chapter called Media Leadership is Essential, Woodworth and Griffin provide a list of things that corporate media should stop doing, a list that includes ignoring “the connection to climate change while reporting extreme weather events” (p61). Which is precisely what the UK’s BBC has been doing for years, and continues to do in the face of a sustained heatwave. This is unacceptable and an abrogation of the Corporation’s responsibilities detailed in its Royal Charter. Ok, so now we’re talking. What’s next? Klein again: “Well, we do what we can. And what we can do…is to consume less, right away”. On its own, these kind of small-scale, individual behaviour changes – of the kind described on the Earth Overshoot Day pages – won’t make much difference without complementary, large-scale “comprehensive policies and programs that make low-carbon choice easy and convenient for everyone” and which, most of all, are fair (pp90-91). Klein’s book is full of examples of action, so just get a copy, read it, and be inspired. Meanwhile, you will have noticed that there is a growing, global, climate litigation movement. Plan B for example, brought the UK Government to Court for failing to set a safe climate target for 2050. It lost that battle last week but plans to pursue the case through appeal. Plan B’s response highlights the stark and bewildering disconnect between the reaction from established institutions (the Courts, the media, the Government) and what, frankly, you, I, the whole world and its cat, can see from our kitchen windows. “As with other legal campaigns confronting powerful vested interests it takes time to break through, and time is not on our side. We’ll be doing everything possible to accelerate the process. Wildfires raging in the Arctic Circle must surely be a wake-up call”. Across the Atlantic, efforts to hold fossil fuel companies financially accountable for the impact of climate change to major US cities (New York, San Francisco and Oakland) also stumbled. As with most assertive action these days, we have ‘the youth’ to thank for taking the lead, and so it is with litigation mobilisation. Take the Children’s Climate Lawsuit, for example, which – since 2015 – has sought to bring both Democrat and Republican government to account, accusing both “of perpetuating policies that favor a fossil-fuel based energy system and of failing to adequately regulate greenhouse gas emissions”. The case continues. If marching is your cup of tea, then make a note of the date – September 8th – and join the global day of action inspired by #RiseForClimate. Marching in itself is an awesome spectacle, but if the kinds of policies that Klein talks about – radical, far-reaching, emissions-busting policies – are going to be passed, and quickly, then marches on their own will not be sufficient. Recall that movements such as #ThisIsZeroHour don’t necessarily have the ear of government even if they are a powerful expression of dissatisfaction with the status quo. We now know who – or what – does have that ear. According to a new study, the fossil fuel industry has spent $2 billion this century lobbying US Congress – an amount 10x that of environmental organisations. Add that to the fact that governments across a small section of the political spectrum are supporting development projects that take us in precisely the opposite direction to where we need to be going – I’m talking specifically about the UK’s cross-party support for a third runway at Heathrow airport but there are so many other examples – and it is unsurprising to find many people looking for more direct action. Perhaps the best example of direct action across the UK, and globally, is the anti-fracking movement. Adam Vaughan’s comprehensive overview of anti-fracking protest in the UK notes that “The past 12 months [i.e. all of 2017] have not been kind to the embryonic industry” and public support for this dirty, polluting industry has fallen to a record low. Direct action – blockading entrances to sites, physically chaining oneself to the floor to deny heavy plant access – works in a way that marches do not. That is not to say that the latter don’t have a place in political action; clearly they do. 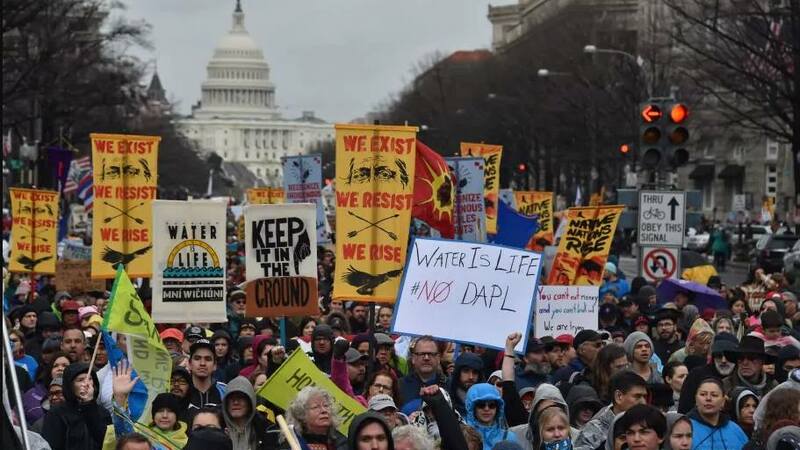 But, as Roger Hallam argues, governments can ignore marches, but they tend to take more notice of direct action (you can watch one of his ppt-free lectures here). 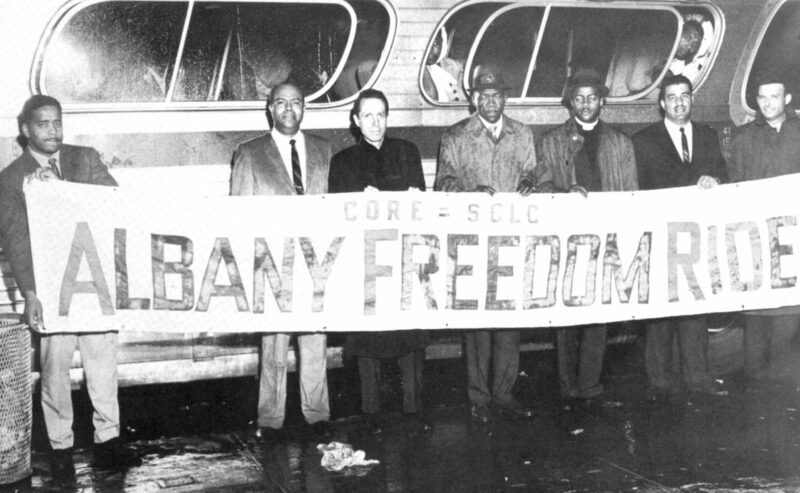 Arrests and, better still, imprisonment, is – in Hallam’s opinion – the most effective act a person can do if they want to effect a change in policy (think Freedom Riders during the civil rights protests in the U.S; The Ploughshares Movement actions to disable Hawk fighter jets; or the recent coordinated hunger strikes and planned direct action by the social movement Rising Up! as a response to global warming). 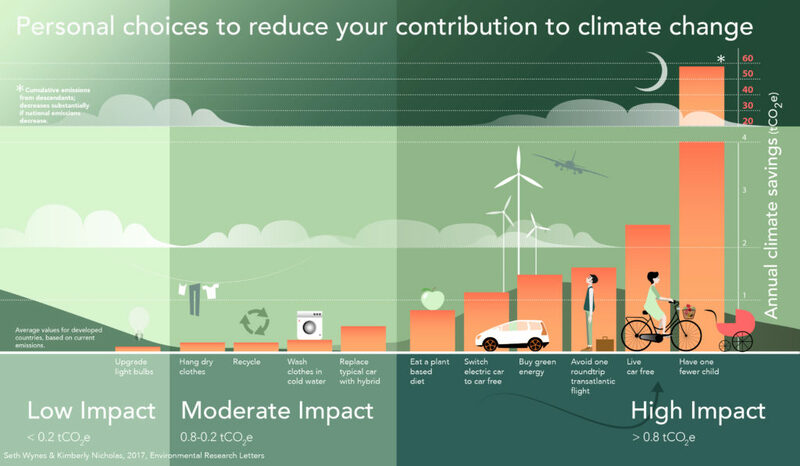 So, to return to the distinction that prompted this post – political action or individual choice – and whether one is more effective than the other in responding to global warming, I think it’s a false distinction. The challenge facing all of us, Naomi Klein tells us, is not to prevent global warming – it’s too late for that – but to avert the worst of it. That requires an initial, individual choice: to decide to do something, or not; to act, or not act. If you choose the former, congratulations, you have evolved into a political animal. Next Post Global warming caused this Summer’s heatwave – there, I’ve said it! The Guardian reported yesterday – 24th July – that UK Energy Minister Claire Perry has issued a permit to Cuadrilla to start fracking in Lancashire, at the Preston New Road site. Respect to the six protestors who locked themselves to the entrance to the site. Perry said: “Our world-class regulations will ensure that shale exploration will maintain robust environmental standards and meet the expectations of local communities”.